Nuno Espirito Santo has resigned as coach of Valencia, the Spanish club where former Manchester United defender Phil Neville is assistant manager. The 41-year-old Portuguese leaves after just over one season in charge. 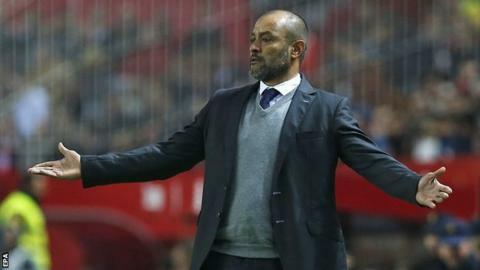 Speaking in a news conference following his team's 1-0 defeat by Sevilla, Nuno said he had told club owner Peter Lim of his decision before Sunday's game. Valencia finished fourth in La Liga last year but have struggled this term, winning five out of 13 games. "I have spoken with the owner, the president and we are all agreed that Valencia is a project for the present and the future and I don't want that to stop," Nuno said. Los Che are yet to announce who will be taking temporary charge. The club qualified for the group stages of this year's Champions League by beating Monaco in a play-off but are close to elimination. They will only progress to the knockout stage if they beat Lyon at home and Gent fail to beat leaders Zenit St Petersburg in the final round of Group H fixtures on on Wednesday, 9 December. Singaporean owner Lim has a stake in Salford City, the non-league club co-owned by Neville with his former Manchester United team-mates Ryan Giggs, Gary Neville and Paul Scholes. Euro round-up: A statue for Suarez? Read more on Euro round-up: A statue for Suarez?